The dedicated calibration solution for workloads to 600 MHz and beyond In many calibration and service applications, a dedicated tool is often the best match to your workload. It allows you to purchase exactly the functionality you need to do the job without having to buy capabilities you don't need. The 5820A is designed for just that situation, where the bulk of your workload consists of oscilloscopes, either in-lab or on-site. It's designed to calibrate all the ranges of functions of the vast majority of digital and analog oscilloscopes in use or being purchased today. The 5820A is compact, portable and rugged. On the bench, its small footprint leaves you plenty of workspace. Outside the lab, it's easy to carry, without the need for extra accessories like pulse heads. For automated applications, the five-channel option allows you to calibrate up to four oscilloscope channels, with trigger, simultaneously without changing cables. This allows you to perform fast, hands-free automated calibrations with documented procedures and results while freeing the operator to complete other work - a dramatic productivity improvement. Plus, the external trigger allows you to work with tough-to-capture signals like fast edges simultaneously. The standard 5820A is designed to calibrate the bulk of your oscilloscope calibration workload - everything up to 600 MHz. Its bandwidth extension option lets you extend that capability still further - to oscilloscopes with bandwidths up to 2.1 GHz. The option can be purchased installed in a new 5820A, or it can be added later as your workload demands it. Either way, you purchase exactly what you need today, with the flexibility to adapt as your needs change. Additional features include an auxiliary feed-through channel that lets you work with external generators up to 2.4 GHz. And there's an external frequency reference input that allows you to enhance the 5820A's frequency accuracy by locking it to an external 10 MHz reference. verifies the vertical amplifiers, attenuators, analog-to-digital converters in DSOs, and all other vertical deflection circuitry for transient response. 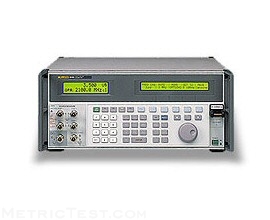 The 5820A's standard £ 300 ps fast edge is more than adequate for most oscilloscopes up to 1 GHz. The 5820A-GHz option provides a £ 150 ps edge for scopes up to 2.1 GHz. verify frequency, accuracy and linearity with a ± 0.33 ppm accuracy, more than enough to calibrate the most demanding digital oscilloscopes. Pulsed sawtooth, square and 20% pulse wave forms are provided. The 5820A also supports the use of an extended frequency reference for even higher frequency accuracy. a 50 kHz to 600 MHz leveled sine wave source (extendible to 2.1 GHz with option) with excellent flatness and amplitude accuracy determines the 3 dB roll-off point of the oscilloscope and detect other discontinuities and drop outs.